Dystonia (DYT) is a genetically heterogeneous disease and is characterized by the coexistence of both familial and sporadic forms. 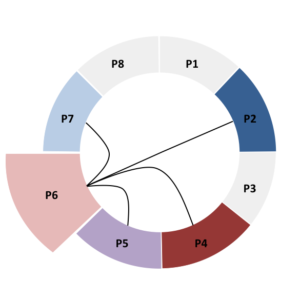 While a number of disease-causing genes have been identified for familial DYT, the etiology of sporadic DYT remains largely unclear. Confirmed genetic causes of familial, isolated DYT are mutations in TOR1A, THAP1, and GNAL; mutations in GCHI also frequently manifest as isolated dystonia. Interestingly, most of the known mutations in these genes express their effects at penetrance rates of 50% or below, suggesting the existence of genetic (and potentially non-genetic) penetrance-modifying factors of relatively large effect. The overarching aim of Project P6 is to search for genetic variants that either protect from disease onset or modify disease expressivity, using unbiased genome-wide screening. This goal will be realized through a multi-pronged experimental protocol that utilizes state-of-the-art high-throughput genotyping and sequencing technologies. First, we will generate genome-wide DNA variant profiles for single nucleotide polymorphisms (SNPs) and copy number variations (CNVs) in ~3,500 carefully characterized DYT patients from Germany and the USA (Objective 1). The resulting genomic data will be combined with genotype profiles in ~21,500 control individuals (also from Germany and the US), enabling us to perform the first bona-fide case-control genome-wide association study (GWAS) in the field to date. In line with the overarching aim of ProtectMove, a particular emphasis will be placed on the identification of novel protective factors by applying a number of novel analytic approaches (Objective 2). In a second set of analyses, we will search for genetic modifiers of disease expressivity by performing quantitative trait locus analyses on different phenotype characteristics, restricting our analyses to the DYT cases (Objective 3). In the final phase of our project, we will search for functional alleles underlying the genetic associations discovered in the GWAS analyses by performing NGS-based panel sequencing in up to 200 specially selected DYT cases and controls (Objective 4). This project is headed by two PIs with extensive experience in the generation, analysis and interpretation of large-scale genomics data. DNA specimens for all ~3,500 DYT patients have already been ascertained (1,000 of which are already biobanked in Lübeck) and high-quality genome-wide genotype data for the vast majority of controls are already available, ensuring a timely and successful completion of the project within the first 3 years. The novel hypotheses and gene candidates emerging from the initial results will be subjected to further follow-up, validation and functional characterization in years 4-6 by us and our ProtectMove partners.